We’ve discussed the pros, cons, and appropriate applications of commercial carpet. One other option when considering commercial style carpeting- an option that has skyrocketed in terms of popularity and availability- is carpet tile. Carpet tiles are exactly what they sound like: smaller squares of carpeting, which are installed by laying them together, like tiles. This type of carpeting allows for creating patterns of infinite customization. 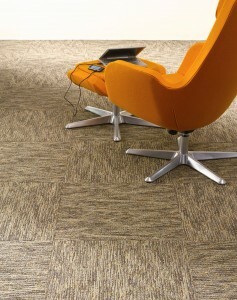 The biggest incentive to utilize carpet tile, rather than broadloom carpeting, is the ease of installation. The flooring can be installed quickly, and can be completed when offices are closed, to avoid business disruption. It can be installed section-by-section, meaning that less moving of furniture is required. And if one section of carpeting eventually gets stained or otherwise flawed, it’s a simple process of removing the affected carpet tiles, and replacing them with new ones- no cutting or measuring required.